They are waterproof and have steel toes. They are in excellent condition. Any spots will be disclosed, otherwise they are from the lens. Recycling is good for everyone! All communication must go through e-bay. THE FIRERANGE. SIZE: 7 EE XW. 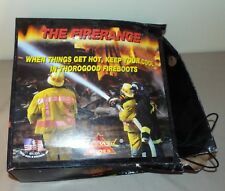 FIRE FIGHTING BOOTS. 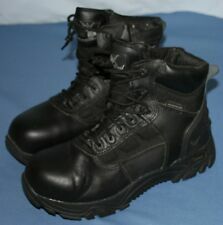 THESE BOOTS FEATURE: SLIP RESISTANT, ELECTRICAL HAZARD, WATERPROOF, STEEL TOE, PUNCTURING RESISTING, SYMPATEX. MADE IN THE U.S.A. 10" HEIGHT. # 804-6391.